The Canucks are coming off a convincing win against the Chicago Blackhawks and will look to keep the good times rolling against the New Jersey Devils. Cory Schneider and Co. will wrap up a 4-game road trip against the Canucks, having gone 1-1-1 thus far on their Western Canada swing. 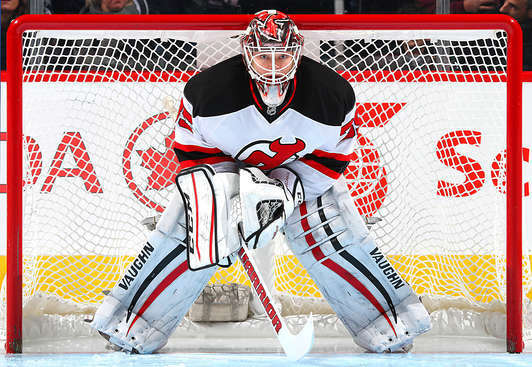 Last year may have been Cory Schneider’s return to Vancouver, but it was far from triumphant. Early in the season, the Canucks beat the Devils 3-2 on an overtime goal from another now former Canuck, Mike Santorelli. The Canucks took the next contest between the two clubs in a shootout 16 days later. Let’s hope they can stick with the positive trend. The storylines entering tonight likely would have revolved around Cory Schneider and Bo Horvat, save for the news of the passing of a Canucks legend. Pat Quinn passed away in Vancouver yesterday. You can bet there will be some added motivation for the Canucks to perform well. The Canucks will honour Quinn before the game, as he was a major piece of the franchise for almost ten years. In fact, they’ve already released a tribute video for him. It is with heavy hearts that the hockey world mourns the loss of Pat Quinn. Widely regarded as one of the best men around the game, he will be sorely missed. Quinn was among the very first Canucks, playing during the inaugural and second season of the franchise’s existence. “The Big Irishman”, Quinn wore number 3 with the Canucks and was inducted into the Ring of Honour in April of last year. Quinn truly left his mark on the Canucks during the years he managed and coached the team, from 1987 to 1997. He drafted the Canucks current president of hockey operations, Trevor Linden (who passed on this statement yesterday) and superstar Pavel Bure. He manufactured a championship calibre team before stepping behind the bench to win his second Jack Adams Award in 1992. Of course, he was also the head coach during the magical 1994 Stanley Cup Final run. Apart from the Canucks, Quinn played and/or coached for the Toronto Maple Leafs, Atlanta Flames, Philadelphia Flyers (where he won his first Jack Adams Award), Los Angeles Kings, and Edmonton Oilers. He also coached on the international stage, notably coaching the Canadian National Team to Olympic Gold in Salt Lake City in 2002, our country’s first such medal in 50 years. Quinn still remains the only coach to win the U-18 World Championship, the IIHF World Junior Championship, and Olympic Gold. Oh, and he has two Memorial Cups to his name as well. One with the Edmonton Oil Kings in 1963 as a coach and another with the Vancouver Giants in 2007 as a part-owner. He was also awarded the Order of Canada in 2012. A shoe-in for the Hockey Hall of Fame, Quinn was actually a member of the selection committee and was voted Chairman in 2013. It’s safe to say that Quinn will be missed throughout the entirety of the hockey world, perhaps nowhere more than in Vancouver. It may not be fair to either player, but the comparison between Cory Schneider and Bo Horvat is inevitable until long after they have both retired. Last year was too early to accurately evaluate the trade (and it probably still is), but this will be the first game we see both centerpieces of the trade on the same ice surface. It was a strange scene in New Jersey two years ago. Gary Bettman approached the podium, to a chorus of boos of course, and announced a shocking trade. It is one of the most defining moments in recent Canucks franchise history. While it was regarded with a great deal of confusion and disdain when it happened, it only got worse once everyone around the team realized that Roberto Luongo wasn’t going to be the answer in net either. Schneider has been the very definition of a workhorse this year, starting the first 20 games of the season for the Devils. He’s been relatively average with a 9-8-2 record accompanied by a .914 SV% and 2.58 GAA. Unfortunately for him, the Devils are in the bottom third of the league when it comes to scoring. It’s worth noting that the 42-year-old Jaromir Jagr again leads the team with 13 points. By the way, how awesome is Jaromir Jagr? Schneider didn’t and will never receive the same reception Ryan Kesler did last week, and that’s to be expected. He was a fan favourite and, many believe, remains one of the best goalies in the NHL. However, it’s time to move on and nobody has made that more clear than the player coming back the other way in that (in)famous trade. 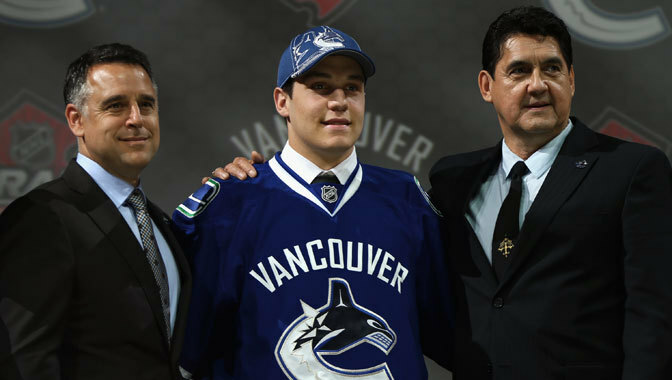 It appears Bo Horvat wanted to erase any doubt in the minds of Jim Benning, Trevor Linden, and Willie Desjardins with regard to demoting the 19-year-old to the OHL London Knights. Hell, people thought the Canucks might lend him out to Team Canada for the World Juniors. That’s not likely to happen should Horvat continue his strong play. Three assists against the mighty Blackhawks nicely complimented his first NHL goal against the Ducks a game before. Entering his 9th game of the season, Horvat continues to centre a stellar “4th line” between Derek Dorsett and NHL ‘First Star of the Week’ Jannik Hansen. Aside from the recent offensive output, Horvat truly seems to be finding his stride amongst the professionals. His two-way play has excelled under coach Willie Desjardins, while quickly becoming the Canucks top face-off man. He is currently 55 for 91 (good for just over 60%) in the faceoff dot after another stellar performance against the Hawks (8 for 8 in the defensive zone, and 13 for 16 overall). Many have speculated that he’s here to stay, but with one more game to go before he officially burns the first year of his entry level contract, fans surrounding the Canucks would love to see him put an exclamation mark on what has been an excellent “tryout”. The news that Dan Hamhuis will be out “for a bit” is certainly not welcome, but the Canucks may get Alex Burrows back for this game. Both he and Chris Higgins (hurt after a blocked shot) were on the practice ice yesterday morning. Burrows mentioned he would take the morning skate and make a decision. A Burrows insertion into the lineup would likely mean that Linden Vey would come out of the lineup. As always, we will update this section after the morning skate. In what will likely be a very passionate effort on behalf of the Canucks, it’s hard to bet against the home team in this game. Combine that with the Devils coming off a demoralizing shootout loss in Calgary two nights ago and I’d say there is a pretty good shot the Canucks walk away with two points. Personally, I’d like to see a little poetic justice in the form of a Bo Horvat goal on Cory Schneider. If it doesn’t happen, that’s okay… but if it does, oh boy. I’m predicting the Canucks win by a score of 3-0.